Estella's Revenge: 5 Reasons to Read NIMONA, a Badass Who Won't Quit! 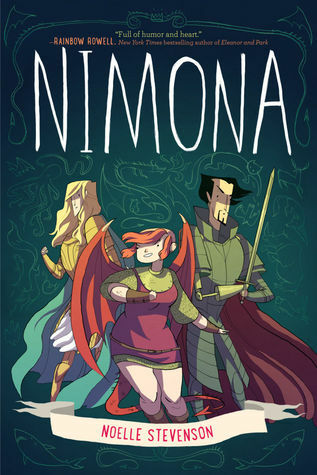 5 Reasons to Read NIMONA, a Badass Who Won't Quit! Sometimes you read a comic and it just clicks immediately. You know it's going to be one of your faves of the year because really...what could top it? That was the case when I sucked down Nimona, by Noelle Stevenson. Ballister Blackheart is a villain, but only because unfortunate circumstances forced him into it; he's not so much into the killing. One day a young girl named Nimona blows into his life. She's a shapeshifter, she wants to be his sidekick, and she's not afraid to kill. For all her chirpy cuteness she's a badass who can morph from a cat to a rhino to a vicious hell beast with almost no effort whatsoever. Nimona has Blackheart's old friend and nemesis, Abrosius Goldenloin, in her crosshairs as well as the Institution of Law Enforcement and Heroics. 1. It's subversive, irreverent, and it plays with the reader's expectations and toys with sff tropes. Villains with kind hearts, little girls scorned and thirsty for blood, knights in love. Nothing is as it seems. 2. Stevenson has created a seemingly medieval world where swords and laser guns exist side by side. New dangers + old dangers make for a whole lotta harrowing. 3. The ladies drive the bulk of the action here. Nimona, obviously, but also the Director, the mysterious and evil hand behind the Institution of Law Enforcement and Heroics. And we mustn't forget Dr. Meredith Blitzmeyer whose most powerful invention will change the game. 4. If you read and loved Lumberjanes, you can expect a similar kind of voice here. Stevenson's dialogue is quick, witty, and sharp. 5. This is artwork to get lost in. While it isn't as rich and colorful as the cover of the book, the style is easy and involving. Go forth and borrow (or purchase)! I love reading Nimona as a webcomic and sure wouldn't mind reading it again as an actual physical book! Such fun. I hate that I missed it when it was a webcomic. I'm bound and determined to follow more webcomics and actually read them before I have to pay for the trades! My "why read it" would have been: 1. Noelle Stevenson. I was sooooooo tempted to stop there! So so so tempted! AS SOON AS I CAN GET MY HANDS ON IT. I swear. I can't wait. Yesssssss! You will stinking love it. Oooooh, running to the library to put on hold now, thanks! Awesome! I hope there aren't tooooo many people in front of you! I don't think this is for me but I know I'm in the minority. Adding it to my list. Love the sound of this one. I have been seeing this one around a lot - I just need to go and get this book from my library. I hope you can get it quickly! So much fun. I beam joyfully at your love of Nimona every single time it comes up. What a great book. All with the science and the sharks and everything -- best. Wooooo! Girl, I cannot gush enough! Sharks! I found a shark phone charm and I'm tempted. Soooo so tempted. I love the sound of this! I have to admit, I'm kind of turned off by sharper, more angular drawing when it comes to comics, so the curviness of this one is appealing to me (for whatever reason!). It's so quirky and irreverent and fantabulous! And I'm right there with you...I love curves in my comics. They're cozy! Swords and laser guns side by side! That's definitely for me. They go together like pickles and ice cream. Or something. I think I will plan to pick this one up for the next Readathon. I love when characters have unexpected traits! It's a great one for readathon...involving, quick, and LOL awesome. Your review has me really looking forward to reading this book! It sounds like so much fun! It is! I hope you love it! Yep, I agree with all of this. SO DELIGHTFUL. Isn't it? I wish there were more like it. Sigh. Yeah, I was disappointed at first, too, but I got used to it pretty quickly. I bet the webcomic thing definitely plays a part in that. This sounds kinda awesome. I'm gonna look for it. It's so much fun! I think you'd love it. I want to read this so badly! I haven't yet, but I've also been super impressed by the names of the characters haha. Just requested it from the library! Thanks for mentioning Lumberjanes. I couldn't remember that title the other day when I was at the library and just requested that one, too. Waaant! Everyone I've seen read it has been into it.